Revolution Youth is our phenomenal secondary school and college student ministry. Our vision is to inspire a generation to win a generation. 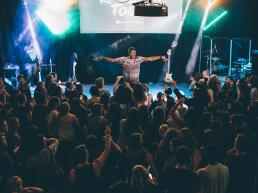 Every week in term time, Revolution Youth meet for epic hangouts. 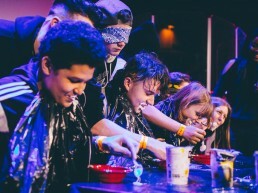 You’ll meet awesome people, take part in crazy games and insane tribe wars challenges, experience our amazing youth band, and hear an inspirational message from the Bible given by one of our team. Everyone’s invited, so bring a mate! 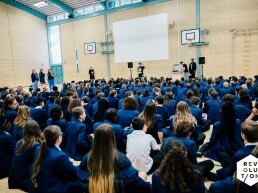 The Revolution Tour is our annual schools tour for anti-bullying week. Our aim is to inspire young people to have the boldness and courage to stand up and be a positive influence in their worlds. Featuring world class creative artists and youth communicators, The Revolution Tour’s mission is to encourage and empower every student to be the best they can be, and to see schools transformed for the better. At Revolution Youth we love to partner with local schools. We currently run a variety of programmes and groups at Jubilee High School in Addlestone, Heathside School in Weybridge, Fullbrook School in New Haw, and Christ’s School in Richmond. Our programmes provide a great environment for students to connect & hang out, play interactive games and discuss different faith topics. If you would like Revolution Youth to come to your school then please get in contact with us below. Please note our services are free to schools.